M106 is an intermediate spiral galaxy with an unusual central glow making it one of the closest examples of the Seyfert class of galaxies, about 22 to 25 million light years away.Among other galaxies shown is the edge on spiral galaxy NGC 4217 upper right in the frame. 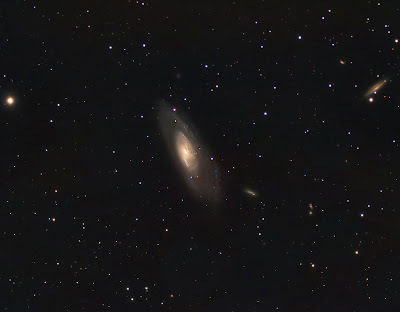 Exposures were 26x300s L,6x300s each for R,G,B binned x2 with a SX Trius 694 camera on a Takahashi 106 refractor, Frames were acquired,stacked,calibrated and modified using Nebulosity.AstroArt and PhotoShop. 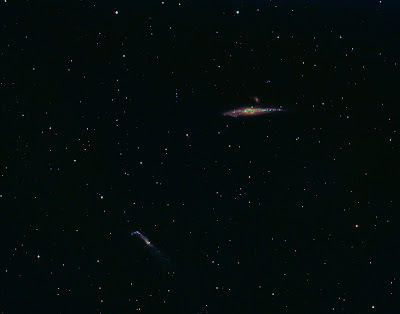 NGC 4631, the Whale and its smaller companion NGC 4627 in Canes Venatici may have been involved in a close encounter with the distorted galaxy, the hockey stick shaped NGC 4656 in the past. The camera used was a SX Trius 694 mono on a Takahashi 106 refractor. 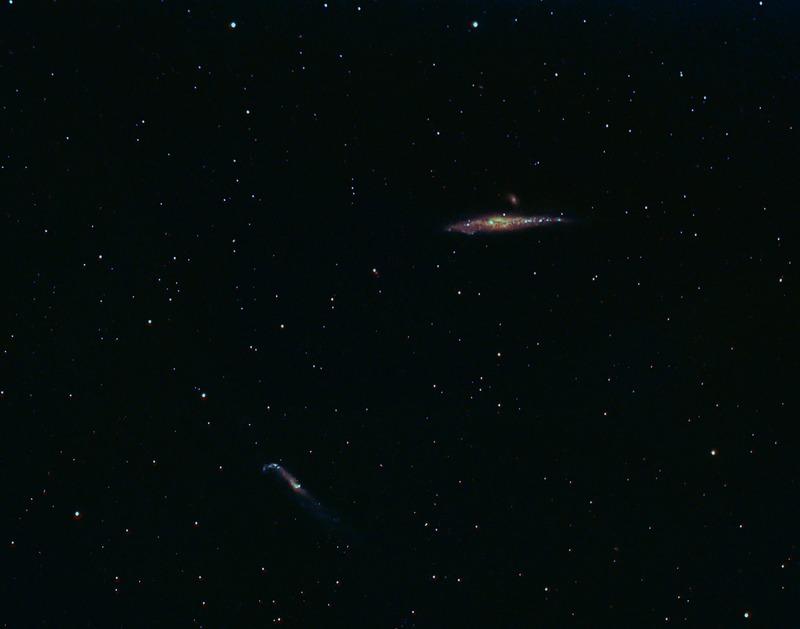 Exposures were 24x300sl,3x600s Ha unbinned, 4x300s binned x2 each for R ,G and B,using Nebulosity, AstroArt and PhotoShop for acquisition calibration and processing. This is the Moon's far south-south-east region. The libration was quite favourable but the picture was taken two days after full moon, so the edge is the terminator and not the limb. The libration zone is in darkness. 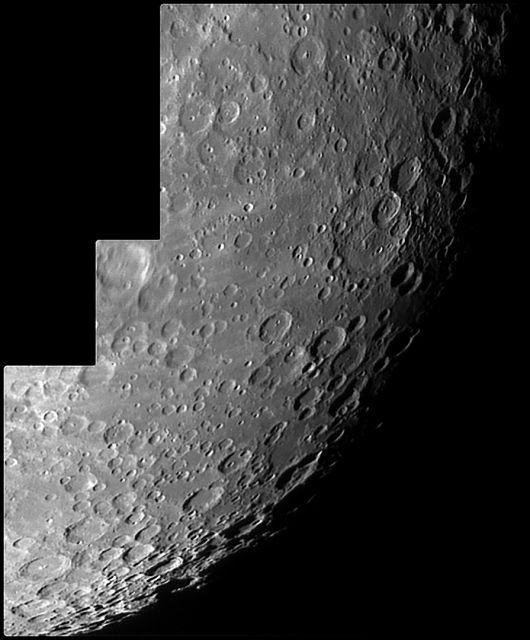 It is a mosaic of three frames taken using an Imaging Source DMK 21AF04 camera at prime focus of the EXT125. Each frame was made from a 60-second video using multi-point alignment in RegiStax 6 and enhanced slightly with wavelets 1 and 2 set to 5. It was further sharpened by using Focus Magic and the contrast and brightness adjusted slightly in PhotoImpact. 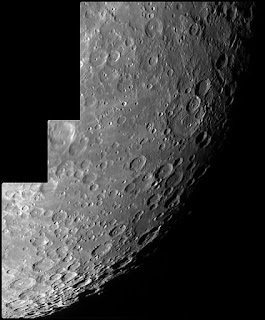 There are a number of interesting features in this region of the Moon. In particular, here, the large, degraded crater Janssen is nicely revealed (a little above the centre of the picture towards the right).